Dealing with the police can be intimidating. Don’t let them bully you or others! KNOW YOUR RIGHTS – Keep calm and make it clear that you know your rights and won’t be walked over. Information is a weapon. The police routinely lie so do not expect them to tell the truth: they will take advantage of our ignorance of the law while often they don’t know the law themselves, preferring to make it up as they go along. STICK TOGETHER with friends or others in trouble, help each other out and stay solid. They rely on our isolation and fear of punishment to keep us under control and to have it all their way. 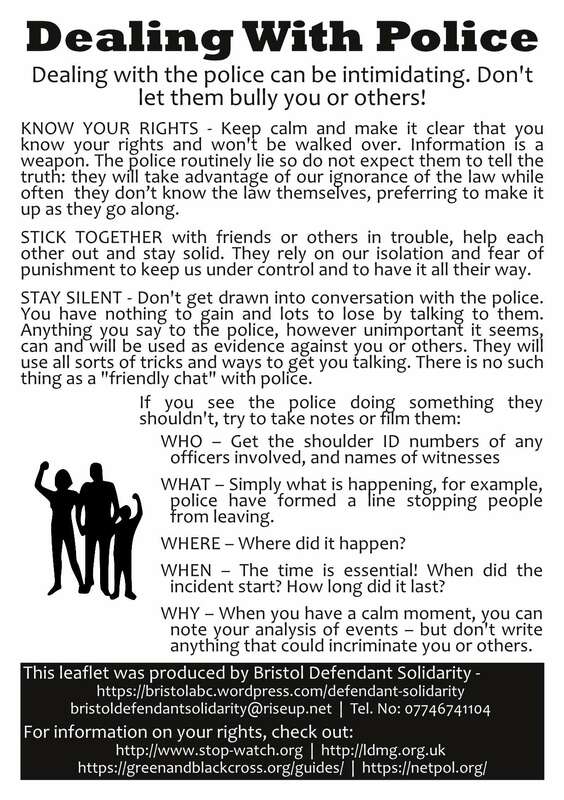 STAY SILENT – Don’t get drawn into conversation with the police. You have nothing to gain and lots to lose by talking to them. Anything you say to the police, however unimportant it seems, can and will be used as evidence against you or others. They will use all sorts of tricks and ways to get you talking. There is no such thing as a “friendly chat” with police. WHAT – Simply what is happening, for example, police have formed a line stopping people from leaving. WHEN – The time is essential! When did the incident start? How long did it last? WHY – When you have a calm moment, you can note your analysis of events – but don’t write anything that could incriminate you or others. The resources and advice on this site!